Found throughout the Zambezi river system, the Cunene and Kafue Rivers, Luapula-Mweru system. Also known from the Okavango and Zambian Congo systems, and Lake Kariba . Males will have more vibrant colouration when displaying to females. A reasonably peaceful fish, but do not keep with delicate or shy tank mates as these fish can become boisterous during spawning. Do not keep with long-finned or slow-moving fish as they run the risk of being nipped. Do not keep with larger predatory fish. Will accept most foods, but prefers live/frozen foods such as bloodworm, which is said to enhance their colouration. Appreciates a spacious aquarium with equal open swimming space and hiding places. Does best in soft acidic water the addition of oak leaves or blackwater extract which introduces tannins, it is said this may further enhance their natural colouration. A generally peaceful loosely shoaling fish, males will bicker between themselves when it comes to displaying to females. 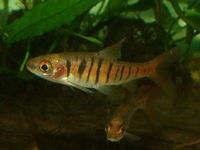 Resembles a more elongate Tiger Barb with thinner dark bands, but the same orange base colour. The bars will become iridescent blue-black and the orange rich and vibrant in the males when they display to females.